Few things bring me back to childhood the way certain taste memories do. My mom's banana bread is one of them because it has always been different from every other banana bread I've tried. Mostly I don't care for banana bread because it is so dry. And don't even try to add walnuts! Having a mother who is allergic to all nuts, I grew up never having crunchy nuts added to brownies, cakes or muffins. 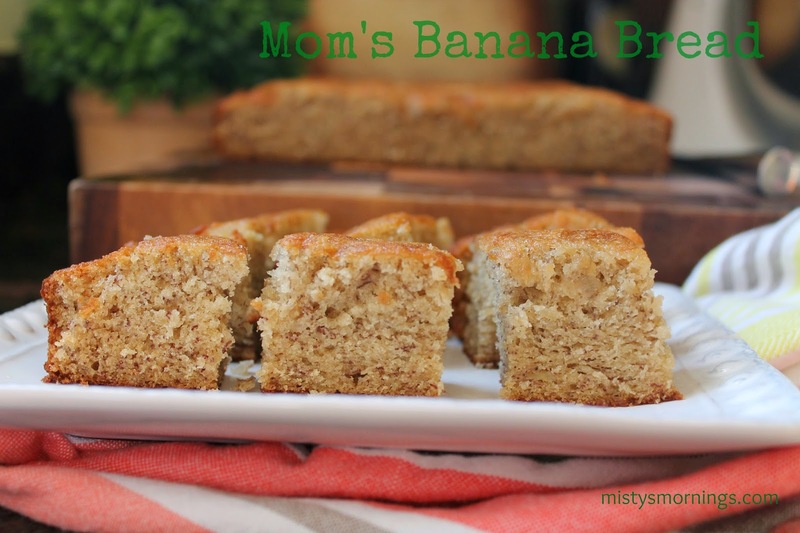 Now I occasionally like them that way but Mom's banana bread remains nut-free. The reason this recipe makes such a moist bread is the use of shortening rather than butter and the fact that it is baked in a shallow, square pan rather than a loaf pan. Having a shallow pan allows the bread to bake through the middle before the outer edges get overdone. There is nothing simpler than this quick recipe. The kids love it and I often make extra and freeze it for a future weekend morning treat. Once you try this recipe you'll never fear those leftover bananas anymore. Happy baking! 2. Peel bananas. Place in a medium bowl and mash well with a fork. Set aside. 3. In a large bowl beat together shortening and sugar until creamy. 4. Add eggs to sugar mixture and beat only until blended. 5. With mixer on low speed add mashed bananas and beat until well combined. 6. Add flour, soda and salt on top of wet mixture and beat on low until thick batter forms. 7. Spread batter evenly into greased 8x8 square pan. 8. Bake for 25-30 minutes or until center is set. 9. Cool in pan and serve with softened butter. If you made banana bread, that means a lot of healing has taken place with your knee!!! YAY!!! This recipe looks divine, although when I made banana bread 2 days ago, my google search was 'banana bread no mixer' because my huge mixer is in a closet downstairs. My kitchen cupboards are so few and so small that the mixer doesn't fit in any of them, and I don't use it enough to keep it handy on the limited counters we have. Sigh. I'll have to get over the laziness of getting it out and putting it away to try this recipe. That and my fear of shortening. Sorry to say, I just have never used it! H2U!!! !